Children riding in the car should sit in the rear seat and must always be properly restrained to minimize the risk of injury in an accident, sudden stop or sudden maneuver. According to accident statistics provided by the National Highway Traffic Safety Administration (NHTSA), children are safer when properly restrained in the rear seats than in the front seat. Larger children not in a child restraint should use one of the seat belts provided. All 50 states have child restraint laws. You should be aware of the specific requirements in your state. Child and/or infant safety seats must be properly placed and installed in the rear seat. You must use a commercially available child restraint system that meets the requirements of the Federal Motor Vehicle Safety Standards (FMVSS). Child restraint systems are designed to be secured in vehicle seats by lap belts or the lap belt portion of a lap/shoulder belt, or by a LATCH system (if equipped). Children could be injured or killed in a crash if their restraints are not properly secured. For small children and babies, a child seat or infant seat must be used. Before buying a particular child restraint system, make sure it fits your car seat and seat belts, and fits your child. Follow all the instructions provided by the manufacturer when installing the child restraint system. WARNING: o A child restraint system must be placed in the rear seat. Never install a child or infant seat on the front passenger's seat. Should an accident occur and cause the passenger side airbag to deploy, it could severely injure or kill an infant or child seated in an infant or child seat. Thus only use a child restraint in the rear seat of your vehicle. o A safety belt or child restraint system can become very hot if it is left in a closed vehicle on a sunny day, even if the outside temperature does not feel hot. Be sure to check the seat cover and buckles before placing a child there. o When the child restraint system is not in use, store it in the luggage compartment or fasten it with a safety belt so that it will not be thrown forward in the case of a sudden stop or an accident. o Children may be seriously injured or killed by an inflating airbag. All children, even those too large for child restraints, must ride in the rear seat. WARNING: To reduce the chance or serious or fatal injuries: o Children of all ages are safer when restrained in the rear seat. A child riding in the front passenger seat can be forcefully struck by an inflating airbag resulting in serious or fatal injuries. o Always follow the instructions for installation and use of the child restraint maker. o Always make sure the child seat is secured properly in the car and your child is securely restrained in the child seat. o Never hold a child in your arms or lap when riding in a vehicle. The violent forces created during a crash will tear the child from your arms and throw the child against the car’s interior. o Never put a seat belt over yourself and a child. During a crash, the belt could press deep into the child causing serious internal injuries. o Never leave children unattended in a vehicle – not even for a short time. The car can heat up very quickly, resulting in serious injuries to children inside. Even very young children may inadvertently cause the vehicle to move, entangle themselves in the windows, or lock themselves or others inside the vehicle. WARNING: o Never allow two children, or any two persons, to use the same seat belt. o Children often squirm and reposition themselves improperly. Never let a child ride with the shoulder belt under their arm or behind their back. Always properly position and secure children in rear seat. o Never allow a child to stand-up or kneel on the seat or floorboard of a moving vehicle. During a collision or sudden stop, the child can be violently thrown against the vehicles interior, resulting in serious injury. o Never use an infant carrier or a child safety seat that "hooks" over a seatback, it may not provide adequate security in an accident. o Seat belts can become very hot, especially when the car is parked in direct sunlight. Always check seat belt buckles before fastening them over a child. o Always store or secure a child seat, even when it is not in use. During a collision or sudden stop, the child seat could be thrown inside the vehicle. 2. Route the child restraint seat tether strap over the seatback. For vehicles with adjustable headrests, route the tether strap under the headrest and between the headrest posts, otherwise route the tether strap over the top of the seatback. 3. Connect the tether strap hook to the child restraint hook holder and tighten to secure the seat. WARNING: o Install the Child Restraint Seat fully rearward against the seatback, with the seatback reclined two positions from the most upright latched position. o A child can be seriously injured or killed in a collision if the child restraint is not properly anchored. Always follow the child seat manufacturer’s instructions for installation and use. WARNING: o Never mount more than one child restraint to a single tether or to a single lower anchorage point. The increased load caused by multiple seats may cause the tethers or anchorage points to break, causing serious injury or death. Some child seat manufacturers make safety seats that are labeled as ISOFIX or ISOFIXcompatible child seats. These seats include two rigid or webbing mounted attachments that connect to two ISOFIX anchors at specific seating positions in your vehicle. This type of child seat eliminates the need to use seat belts to attach the child seat for forward-facing child seats. ISOFIX anchors have been provided in your vehicle. The ISOFIX anchors are located in the left and right outboard rear seating positions. Their locations are shown in the illustration. There is no ISOFIX anchor provided for the center rear seating position. WARNING: o A child can be seriously injured or killed in a collision if the child restraint is not properly anchored. Always follow the child seat manufacturer’s instructions for installation and use. o Never install a child restraint using the ISOFIX anchors at the center position of the rear seat. In a crash, the ISOFIX anchors may break if a car seat is improperly placed in the center position resulting in serious or fatal injuries. Only place a ISOFIX or ISOFIX-compatible child seat in the left or right out-board rear seating positions (as shown) to the appropriate ISOFIX anchors provided. WARNING: o Never mount more than one child restraint to a single tether or to a single lower anchorage point. The increased load caused by multiple seats may cause the tethers or anchorage points to break, causing serious injury or death. o When using the vehicle’s “ISOFIX” system to install a child restraint system in the rear seat, all unused vehicle rear seat belt metal latch plates or tabs must be latched securely in their seat belt buckles and the seat belt webbing must be retracted behind the child restraint to prevent the child from reaching and taking hold of unretracted seat belts. Unlatched metal latch plates or tabs may allow the child to reach the unretracted seat belts which may result in strangulation and a serious injury or death to the child in the child restraint. Follow the child seat manufacturer's instructions to properly install safety seats with ISOFIX or ISOFIX-compatible attachments. Once you have installed the ISOFIX child restraint seat, assure that the seat is properly attached to the ISOFIX and tether anchors. Also, test the safety seat before you place the child in it. Tilt the seat from side to side. Also try to tug the seat forward. Check to see if the anchors hold the seat in place. CAUTION: Do not allow the rear seat belt webbing to get scratched or pinched by the ISOFIXseat latch and ISOFIX anchor during the installation. WARNING: A child can be seriously injured or killed in a collision if the child restraint is not properly anchored to the car and the child is not properly restrained in the child restraint. Always follow the child seat manufacturer’s instructions for installation and use. To install a child restraint system in the outboard rear seats, extend the shoulder/lap belt entirely from its retractor until a "click" is felt. 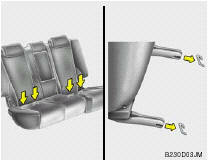 This will engage the seat belt retractor automatic locking feature, which allows the seat belt to retract but not extend. Install the child restraint system, buckle the seat belt and allow the seat belt to take up any slack. Make sure that the lap portion of the belt is tight around the child restraint system and the shoulder portion of the belt is positioned so that it can not interfere with the child's head or neck. Also, double check to be sure that the retractor has engaged the Automatic Locking feature by trying to extend webbing out of the retractor. If the retractor is in the Automatic Locking mode, the belt will be locked. After installation of the child restraint system, try to move it in all directions to be sure the child restraint system is securely installed. If you need to tighten the belt, pull more webbing toward the retractor. When you unbuckle the seat belt and allow it to retract, the retractor will automatically revert back to its normal seated passenger Emergency Locking usage condition. NOTE: o Before installing the child restraint system in any seating position, read the instructions supplied by the child restraint system manufacturer. 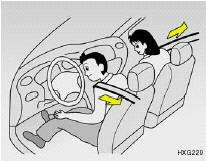 o If the seat belt does not operate as described, have the system checked immediately by your authorized Hyundai dealer. WARNING: o If the retractor is not in the Automatic Locking mode, the child restraint can move when your vehicle turns or stops suddenly. A child can be seriously injured or killed if the child restraint is not properly anchored to the car, including setting the retractor to the Automatic Locking mode. o Do not install any child restraint system in the front passenger seat. Should an accident occur and cause the passenger side airbag to deploy, it could severely injure or kill an infant or child seated in an infant or child seat. Therefore, only use a child restraint system in the rear seat of your vehicle. Your Hyundai vehicle is equipped with driver's and front passenger's pre-tensioner seat belts. The purpose of the pre-tensioner is to make sure that the seat belts fit tightly against the occupant's body in certain frontal collisions. The pre-tensioner seat belts may be activated with or without airbag activation, depending on the circumstances of a collision. 1. SRS airbag warning light. 2. Retractor pre-tensioner assembly. 3. SRS control module. WARNING: To obtain maximum benefit from a pretensioner seat belt: o The seatbelt must be work correctly and adjusted to the proper position. Please read and follow all of the important information and precautions about your vehicle’s occupant safety features – including seat belts and advanced airbags – that are provided in this manual. o Be sure you and your passengers always wear seat belts and wear them properly. 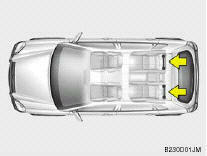 NOTE: o Both the driver's and front passenger's pre-tensioner seat belts will be activated in certain frontal collisions. The pretensioner seat belt may be activated with or without airbag activation, depending on the circumstances of a collision. The pre-tensioners will not be activated if the seat belts are not being worn at the time of the collision. o When the pre-tensioner seat belts are activated, a loud noise may be heard and fine dust, which may appear to be smoke, may be visible in the passenger compartment. These are normal operating conditions and are not hazardous. o Although it is harmless, the fine dust may cause skin irritation and should not be breathed for prolonged periods. Wash all exposed skin areas thoroughly after an accident in which the pre-tensioner seat belts were activated. CAUTION: o The sensor that activates the SRS airbag is connected with the pre-tensioner seat belts. The SRS airbag warning light on the instrument panel will illuminate for approximately 6 seconds after the ignition key has been turned to the "ON" position, and then it should turn off. o If the pre-tensioner seat belt is not working properly, this warning light will illuminate even if there is no malfunction of the SRS airbag system. If the SRS airbag warning light does not illuminate when the ignition key is turned to "ON" or if it remains illuminated after approximately 6 seconds, or if it illuminates while the vehicle is being driven, please have an authorized Hyundai dealer inspect the pre-tensioner seat belts and SRS airbag system as soon as possible. WARNING: o Pre-tensioners are designed to operate only one time. After activation, pretensioner seat belts must be replaced. All seat belts, of any type, should always be replaced after they have been worn during a collision. o The pre-tensioner seat belt assembly mechanisms become hot during activation. Do not touch the pre-tensioner seat belt assemblies for several minutes after they have been activated. o Do not attempt to inspect or replace the pre-tensioner seat belts yourself. This must be done by an authorized Hyundai dealer. o Do not strike the pre-tensioner seat belt assemblies. o Do not attempt to service or repair the pre-tensioner seat belt system in any manner. o Improper handling of the pre-tensioner seat belt assemblies, and failure to heed the warnings to not strike, modify, inspect, replace, service or repair the pretensioner seat belt assemblies may lead to improper operation or inadvertent activation and serious injury. o Always wear seat belts when driving or riding in a motor vehicle.